China to cripple Japan with financial war over isles row? 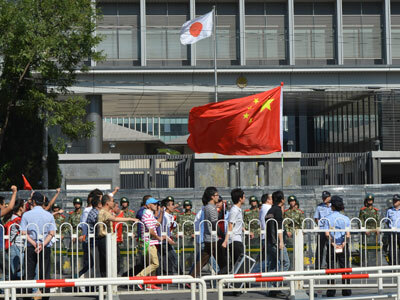 China may introduce economic measures to cripple Japan in order to gain the upper hand in a territorial row. 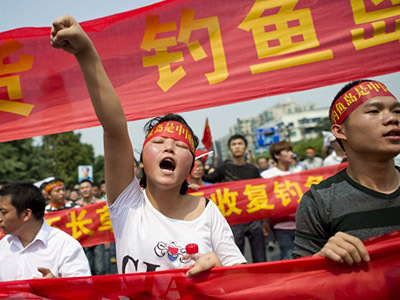 Following violent anti-Japanese protests and increasingly bellicose rhetoric, Beijing could employ sanctions to subdue its neighbor. State newspaper China Daily wrote that China should take “strong countermeasures” in light of the “ridiculous” Japanese nationalization of the isles, called the Diaoyu by the Chinese. “Japanese companies earn huge profits from their exports to China. That means China is in a lot better position to afford a loss in exports,” wrote Jin Baisong from the Chinese Academy of International Trade. In this way he stipulated that China could deal a heavy blow to the Japanese economy without doing significant damage to its own. “Japan should reconsider its financial health. In other words, with Japan's national debt at stake… And China can use it to find ways to impose sanctions on Japan in the most effective manner,” said the article. 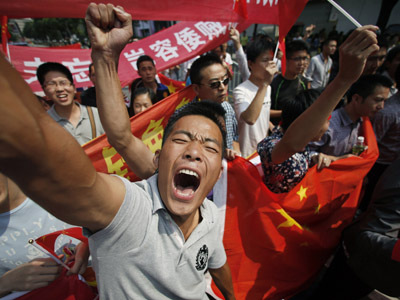 Tensions have reached boiling point over the territorial disputes that triggered the outbreak of mass anti-Japanese riots throughout China over the last week. Japan provoked Chinese ire when it announced a plan to buy the contested islands from their private Japanese owner last Tuesday. "The farce of buying the Diaoyu Islands seriously violates China's territorial sovereignty and severely hurts the feelings of the Chinese people, which have aroused strong indignation and opposition across the nation," said a spokesman from the Chinese Ministry of Commerce. 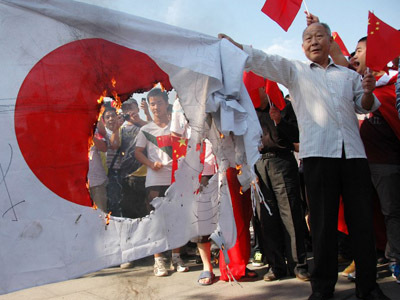 Japan has already felt some financial backlash from the riots that have gripped China over the last few days. Attacks on Japanese brands like Panasonic and Toyota have caused some companies to cease operations until further notice. US Secretary of Defense Leon Panetta is currently in China to discuss the escalating dispute between the Asian nations. He met with China’s leader-in-waiting Xi Jinping, agreeing to strengthen military ties between the two countries. Following the meeting Panetta emphasized the fact the US military’s planned shift into the Pacific was not a threat to China. "Our rebalance to the Asia-Pacific region is not an attempt to contain China. It is an attempt to engage China and expand its role in the Pacific," Panetta said in a speech at the Engineering Academy of PLA. Broaching the subject of the US-Japanese missile signed on Monday, Panetta said that the new defense radar to be built on Japanese territory was aimed specifically at North Korea and is “designed to foster peace and stability in the region." In spite of the US’s claim to neutrality in the conflict between China and Japan, the Japanese government said it had been “mutually agreed” that the islands came under the US-Japanese security pact. 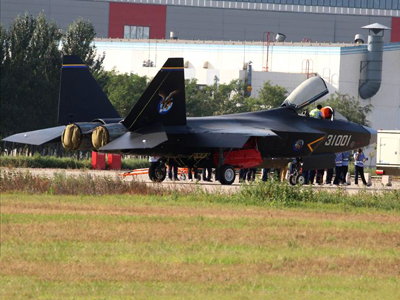 But Professor Shujie Yao, an economics professor at Nottingham University in the UK, told RT that most Chinese people will not trust the US promise that the Japanese missile deal is of no threat to China. “I think the Americans have lost the trust of the Chinese mind, most Chinese people consider that America might be a fairly good economic ally, but not a political or diplomatic one, and the ideological differences between China and the United States make the Chinese believe that all America is trying to do is make trouble for China,” he said. “They are not going to go to war; there is no other result than Senkaku [the Japanese name for the islands] is going to be Japanese and people in China are going to be really angry,” concluded Dawson.